The Party. (L to R) Di Parker*, Evie Bowen, Fred van Berkel, Peter Halbsgut, Janet Moore, Marianne Halbsgut, Gillian Forbes, Marcel Combrink*, Greg Moore, Andre Roux* (*visitors). Not in photo: Tony Bowen (meet leader). Summary. 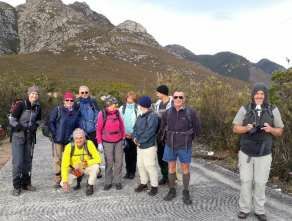 The hike starts at “Sputnik” carpark near the top of the Outeniqua Pass. 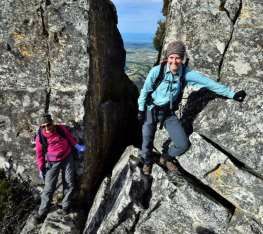 After crossing the highway, the route follows the ridge line on a path to the peak. Currently the path is well used. It goes up steeply requiring occasional scrambling, with some exposure. Grade 2 ½M. The Hike. We set off from Sputnik at 8 am in clear but windy weather. The party of 11 included 3 visitors, who were welcomed after the customary “safety” briefing. 8 made it to the very summit. The final bit is a trifle exposed but has good holds all the way. 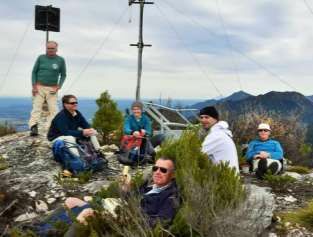 After lunch on top admiring the expansive views, which included snow on the distant Kammanassie and Swartberg ranges, we returned to base by 12.30. To prove conclusively that walking along a paved surface is more dangerous than climbing mountains, one visitor (who shall be nameless) slipped on the sidewalk near the carpark and required 3 stitches to his/her chin.